Small-scale production of concrete-like materials was pioneered by the Nabatean traders who occupied and controlled a series of oases and developed a small empire in the regions of southern Syria and northern Jordan from the 4th century BC. They discovered the advantages of hydraulic lime, with some self-cementing properties, by 700 BC. They built kilns to supply mortar for the construction of rubble-wall houses, concrete floors, and underground waterproof cisterns. They kept the cisterns secret as these enabled the Nabataeans to thrive in the desert. Some of these structures survive to this day. In the Ancient Egyptian and later Roman eras, builders discovered that adding volcanic ash to the mix allowed it to set underwater. A method for producing Portland cement was developed in England and patented by Joseph Aspdin in 1824. Aspdin chose the name for its similarity to Portland stone, which was quarried on the Isle of Portland in Dorset, England. His son William continued developments into the 1840s, earning him recognition for the development of "modern" Portland cement. 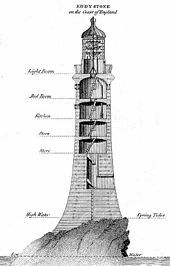 Reinforced concrete was invented in 1849 by Joseph Monier. and the first house was built by François Coignet in 1853. 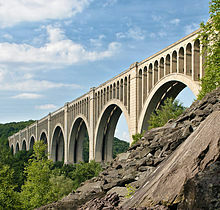 The first concrete reinforced bridge was designed and built by Joseph Monier in 1875. Concrete is a composite material, comprising a matrix of aggregate (typically a rocky material) and a binder (typically Portland cement or asphalt), which holds the matrix together. Many types of concrete are available, determined by the formulations of binders and the types of aggregate used to suit the application for the material. These variables determine strength, density, as well as chemical and thermal resistance of the finished product. A cement, most commonly Portland cement, is the most prevalent kind of concrete binder. For cementitious binders, water is mixed with the dry powder and aggregate, which produces a semi-liquid slurry that can be shaped, typically by pouring it into a form. The concrete solidifies and hardens through a chemical process called hydration. The water reacts with the cement, which bonds the other components together, creating a robust stone-like material. Other cementitious materials, such as fly ash and slag cement, are sometimes added as mineral admixtures – either pre-blended with the cement or directly as a concrete component – and become a part of the binder for the aggregate. Chemical admixtures are added to achieve varied properties. These ingredients may accelerate or slow down the rate at which the concrete hardens, and impart many other useful properties including increased tensile strength, entrainment of air and water resistance. Mineral admixtures have become more popular over recent decades. The use of recycled materials as concrete ingredients has been gaining popularity because of increasingly stringent environmental legislation, and the discovery that such materials often have complementary and valuable properties. The most conspicuous of these are fly ash, a by-product of coal-fired power plants; ground granulated blast furnace slag, a byproduct of steelmaking; and silica fume, a byproduct of industrial electric arc furnaces. The use of these materials in concrete reduces the amount of resources required, as the mineral admixtures act as a partial cement replacement. This displaces some cement production, an energetically expensive and environmentally problematic process, while reducing the amount of industrial waste that must be disposed of. Mineral admixtures can be pre-blended with the cement during its production for sale and use as a blended cement, or mixed directly with other components when the concrete is produced. Structures employing Portland cement concrete usually include steel reinforcement. Such concrete can be formulated with high compressive strength, but always has lower tensile strength. Therefore, it is usually reinforced with materials that are strong in tension, typically steel rebar. Portland cement is the most common type of cement in general usage. It is a basic ingredient of concrete, mortar and many plasters. British masonry worker Joseph Aspdin patented Portland cement in 1824. It was named because of the similarity of its color to Portland limestone, quarried from the English Isle of Portland and used extensively in London architecture. It consists of a mixture of calcium silicates (alite, belite), aluminates and ferrites – compounds which combine calcium, silicon, aluminum and iron in forms which will react with water. 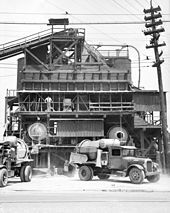 Portland cement and similar materials are made by heating limestone (a source of calcium) with clay or shale (a source of silicon, aluminum and iron) and grinding this product (called clinker) with a source of sulfate (most commonly gypsum). The size distribution of the aggregate determines how much binder is required. Aggregate with a very even size distribution has the biggest gaps whereas adding aggregate with smaller particles tends to fill these gaps. 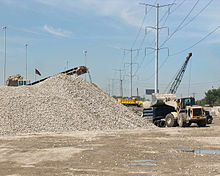 The binder must fill the gaps between the aggregate as well as paste the surfaces of the aggregate together, and is typically the most expensive component. 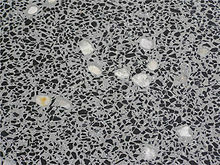 Thus, variation in sizes of the aggregate reduces the cost of concrete. The aggregate is nearly always stronger than the binder, so its use does not negatively affect the strength of the concrete. Air entraining agents add and entrain tiny air bubbles in the concrete, which reduces damage during freeze-thaw cycles, increasing durability. However, entrained air entails a trade off with strength, as each 1% of air may decrease compressive strength by 5%. If too much air becomes trapped in the concrete as a result of the mixing process, Defoamers can be used to encourage the air bubble to agglomerate, rise to the surface of the wet concrete and then disperse. ^ Values shown are approximate: those of a specific material may vary. ^ Specific surface measurements for silica fume by nitrogen adsorption (BET) method, others by air permeability method (Blaine). Carbon nanofibers can be added to concrete to enhance compressive strength and gain a higher Young’s modulus, and also to improve the electrical properties required for strain monitoring, damage evaluation and self-health monitoring of concrete. Carbon fiber has many advantages in terms of mechanical and electrical properties (e.g., higher strength) and self-monitoring behavior due to the high tensile strength and high conductivity. 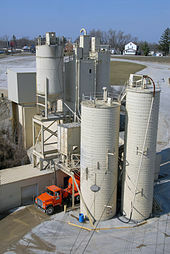 In general usage, concrete plants come in two main types, ready mix plants and central mix plants. A ready-mix plant mixes all the ingredients except water, while a central mix plant mixes all the ingredients including water. A central-mix plant offers more accurate control of the concrete quality through better measurements of the amount of water added, but must be placed closer to the work site where the concrete will be used, since hydration begins at the plant. When initially mixed, Portland cement and water rapidly form a gel of tangled chains of interlocking crystals, and components of the gel continue to react over time. Initially the gel is fluid, which improves workability and aids in placement of the material, but as the concrete sets, the chains of crystals join into a rigid structure, counteracting the fluidity of the gel and fixing the particles of aggregate in place. During curing, the cement continues to react with the residual water in a process of hydration. In properly formulated concrete, once this curing process has terminated the product has the desired physical and chemical properties. Among the qualities typically desired are mechanical strength, low moisture permeability, and chemical and volumetric stability. Thorough mixing is essential to produce uniform, high-quality concrete. Therefore, equipment and methods should be capable of effectively mixing concrete materials containing the largest specified aggregate to produce uniform mixtures of the lowest slump practical for the work. Concrete must be kept moist during curing in order to achieve optimal strength and durability. During curing hydration occurs, allowing calcium-silicate hydrate (C-S-H) to form. Over 90% of a mix's final strength is typically reached within four weeks, with the remaining 10% achieved over years or even decades. The conversion of calcium hydroxide in the concrete into calcium carbonate from absorption of CO2 over several decades further strengthens the concrete and makes it more resistant to damage. This carbonation reaction, however, lowers the pH of the cement pore solution and can corrode the reinforcement bars. Traditional conditions for curing involve by spraying or ponding the concrete surface with water. 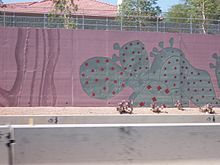 The adjacent picture shows one of many ways to achieve this, ponding—submerging setting concrete in water and wrapping in plastic to prevent dehydration. Additional common curing methods include wet burlap and plastic sheeting covering the fresh concrete. 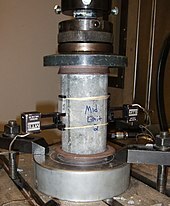 For higher-strength applications, accelerated curing techniques may be applied to the concrete. 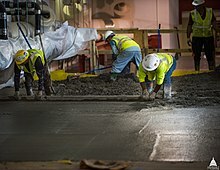 A common technique involves heating the poured concrete with steam, which serves to both keep it damp and raise the temperature, so that the hydration process proceeds more quickly and more thoroughly. Pervious concrete is a mix of specially graded coarse aggregate, cement, water and little-to-no fine aggregates. This concrete is also known as "no-fines" or porous concrete. Mixing the ingredients in a carefully controlled process creates a paste that coats and bonds the aggregate particles. The hardened concrete contains interconnected air voids totaling approximately 15 to 25 percent. Water runs through the voids in the pavement to the soil underneath. Air entrainment admixtures are often used in freeze–thaw climates to minimize the possibility of frost damage. Nanoconcrete contains Portland cement particles that are no greater than 100 μm. It is a product of high-energy mixing (HEM) of cement, sand and water. To ensure the mixing is thorough enough to create nanoconcrete, the mixer must apply a total mixing power to the mixture of 30–600 watts per kilogram of the mix. This mixing must continue long enough to yield a net specific energy expended upon the mix of at least 5000 joules per kilogram of the mix. [irrelevant citation] and may be increased to 30–80 kJ per kilogram. A superplasticizer is then added to the activated mixture which can later be mixed with aggregates in a conventional concrete mixer. In the HEM process, the intense mixing of cement and water with sand provides dissipation and absorption of energy by the mixture and increases shear stresses on the surface of cement particles. As a result, the temperature of the mixture increases by 20–25 degrees Celsius. This intense mixing serves to deepen hydration process inside the cement particles. The nano-sized colloid Calcium Silicate Hydrate (C-S-H) formation increased several times compared with conventional mixing. Thus, the ordinary concrete transforms to nanoconcrete. The initial natural process of cement hydration with formation of colloidal globules about 5 nm in diameter spreads into the entire volume of cement–water matrix as the energy expended upon the mix. The liquid activated high-energy mixture can be used by itself for casting small architectural details and decorative items, or foamed (expanded) for lightweight concrete. HEM Nanoconcrete hardens in low and subzero temperature conditions because the liquid phase inside the nano-pores of C-S-H gel doesn't freeze at temperatures from −8 to −42 degrees Celsius. The increased volume of gel reduces capillarity in solid and porous materials. Grinding of concrete can produce hazardous dust. Exposure to cement dust can lead to issues such as silicosis, kidney disease, skin irritation and similar effects. The National Institute for Occupational Safety and Health in the United States recommends attaching local exhaust ventilation shrouds to electric concrete grinders to control the spread of this dust. In addition, the Occupational Safety and Health Administration (OSHA) has placed more stringent regulations on companies whose workers regularly come into contact with silica dust. An updated silica rule, which OSHA put into effect 23 Sept. 2017 for construction companies, restricted the amount of respirable crystalline silica workers could legally come into contact with to 50 micrograms per cubic meter of air per 8-hour workday. That same rule went into effect 23 June 2018 for general industry, hydraulic fracturing and maritime. It should be noted, however, that the deadline was extended to 23 June 2021 for engineering controls in the hydraulic fracturing industry. Companies which fail to meet the tightened safety regulations can face financial charges and extensive penalties. Cement dust is not the only concern crews face when working with concrete. Improper ergonomics can lead to muscle pains and strains. As such, it is important for crews to practice proper stretching before embarking on a busy workday. Working in close quarters can also place team members in danger. Not only can crowded workspaces make it difficult for crews to safely exit, but certain work environments—such as jobs carried out inside cement mixing drums—make ventilation an obstacle. Furthermore, crews who carry out much of their work outdoors face weather-related concerns. It is important for crews to take special precautions when faced with extremely hot conditions and cold conditions. Such is the case for all outdoor crews, whether they work with concrete or not. Concrete has relatively high compressive strength, but much lower tensile strength. Therefore, it is usually reinforced with materials that are strong in tension (often steel). The elasticity of concrete is relatively constant at low stress levels but starts decreasing at higher stress levels as matrix cracking develops. Concrete has a very low coefficient of thermal expansion and shrinks as it matures. All concrete structures crack to some extent, due to shrinkage and tension. Concrete that is subjected to long-duration forces is prone to creep. Different strengths of concrete are used for different purposes. Very low-strength—14 MPa (2,000 psi) or less—concrete may be used when the concrete must be lightweight. Lightweight concrete is often achieved by adding air, foams, or lightweight aggregates, with the side effect that the strength is reduced. For most routine uses, 20 MPa (2,900 psi) to 32 MPa (4,600 psi) concrete is often used. 40 MPa (5,800 psi) concrete is readily commercially available as a more durable, although more expensive, option. Higher-strength concrete is often used for larger civil projects. Strengths above 40 MPa (5,800 psi) are often used for specific building elements. For example, the lower floor columns of high-rise concrete buildings may use concrete of 80 MPa (11,600 psi) or more, to keep the size of the columns small. Bridges may use long beams of high-strength concrete to lower the number of spans required. Occasionally, other structural needs may require high-strength concrete. If a structure must be very rigid, concrete of very high strength may be specified, even much stronger than is required to bear the service loads. Strengths as high as 130 MPa (18,900 psi) have been used commercially for these reasons. Concrete is one of the most durable building materials. It provides superior fire resistance compared with wooden construction and gains strength over time. Structures made of concrete can have a long service life. Concrete is used more than any other artificial material in the world. As of 2006, about 7.5 billion cubic meters of concrete are made each year, more than one cubic meter for every person on Earth. Aerial photo of reconstruction at Taum Sauk (Missouri) pumped storage facility in late November 2009. After the original reservoir failed, the new reservoir was made of roller-compacted concrete. Due to cement's exothermic chemical reaction while setting up, large concrete structures such as dams, navigation locks, large mat foundations, and large breakwaters generate excessive heat during hydration and associated expansion. To mitigate these effects post-cooling is commonly applied during construction. An early example at Hoover Dam used a network of pipes between vertical concrete placements to circulate cooling water during the curing process to avoid damaging overheating. 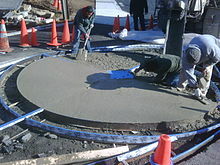 Similar systems are still used; depending on volume of the pour, the concrete mix used, and ambient air temperature, the cooling process may last for many months after the concrete is placed. Various methods also are used to pre-cool the concrete mix in mass concrete structures. Raw concrete surfaces tend to be porous and have a relatively uninteresting appearance. Many different finishes can be applied to improve the appearance and preserve the surface against staining, water penetration, and freezing. Other finishes can be achieved with chiseling, or more conventional techniques such as painting or covering it with other materials. Prestressed concrete is a form of reinforced concrete that builds in compressive stresses during construction to oppose tensile stresses experienced in use. This can greatly reduce the weight of beams or slabs, by better distributing the stresses in the structure to make optimal use of the reinforcement. For example, a horizontal beam tends to sag. Prestressed reinforcement along the bottom of the beam counteracts this. In pre-tensioned concrete, the prestressing is achieved by using steel or polymer tendons or bars that are subjected to a tensile force prior to casting, or for post-tensioned concrete, after casting. Concrete can be damaged by many processes, such as the expansion of corrosion products of the steel reinforcement bars, freezing of trapped water, fire or radiant heat, aggregate expansion, sea water effects, bacterial corrosion, leaching, erosion by fast-flowing water, physical damage and chemical damage (from carbonatation, chlorides, sulfates and distillate water). The micro fungi Aspergillus Alternaria and Cladosporium were able to grow on samples of concrete used as a radioactive waste barrier in the Chernobyl reactor; leaching aluminum, iron, calcium, and silicon. Concrete is widely used for making architectural structures, foundations, brick/block walls, pavements, bridges/overpasses, highways, runways, parking structures, dams, pools/reservoirs, pipes, footings for gates, fences and poles and even boats. Concrete is used in large quantities almost everywhere there is a need for infrastructure. 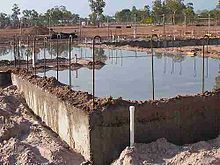 Concrete is one of the most frequently used building materials in animal houses and for manure and silage storage structures in agriculture. Concrete is also the basis of a large commercial industry. Globally, the ready-mix concrete industry, the largest segment of the concrete market, is projected to exceed $600 billion in revenue by 2025. In the United States alone, concrete production is a $30-billion-per-year industry, considering only the value of the ready-mixed concrete sold each year. Given the size of the concrete industry, and the fundamental way concrete is used to shape the infrastructure of the modern world, it is difficult to overstate the role this material plays today. A major component of concrete is cement, which similarly exerts environmental and social effects. :142 The cement industry is one of the three primary producers of carbon dioxide, a major greenhouse gas (the other two being the energy production and transportation industries). Every tonne of cement produced releases one tonne of CO2 into the atmosphere. As of 2019, the production of Portland cement contributed eight percent to global anthropogenic CO2 emissions, largely due to the sintering of limestone and clay at 1,500 °C (2,730 °F). Researchers have suggested a number of approaches to improving carbon sequestration relevant to concrete production. Concrete is used to create hard surfaces that contribute to surface runoff, which can cause heavy soil erosion, water pollution, and flooding, but conversely can be used to divert, dam, and control flooding. Concrete dust released by building demolition and natural disasters can be a major source of dangerous air pollution. Workers who cut, grind or polish concrete are at risk of inhaling airborne silica, which can lead to silicosis. This includes crew members who work in concrete chipping. The presence of some substances in concrete, including useful and unwanted additives, can cause health concerns due to toxicity and radioactivity. Fresh concrete (before curing is complete) is highly alkaline and must be handled with proper protective equipment. It is important to note that, as with concrete chipping, polishing and similar work, the process of recycling concrete can expose workers to dangerous silica dust. A recent silica rule update  set forth by the Occupational Safety and Health Administration (OSHA) limits the legal amount of respirable crystalline silica workers can come in contact with to 50 micrograms per cubic meter of air per 8-hour workday. While specific concrete chipping needs vary by fleet size, concrete blends at play and the specific drums in use, it is generally accepted that a company should have its drums chipped every three months. Such maintenance helps companies avoid slowdowns in production, lowered drum capacity and breakdowns which can affect their bottom line. 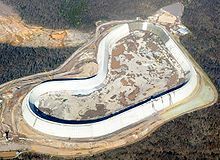 The world record for largest continuously poured concrete floor was completed 8 November 1997, in Louisville, Kentucky by design-build firm EXXCEL Project Management. The monolithic placement consisted of 225,000 square feet (20,900 m2) of concrete placed in 30 hours, finished to a flatness tolerance of FF 54.60 and a levelness tolerance of FL 43.83. This surpassed the previous record by 50% in total volume and 7.5% in total area. The record for the largest continuously placed underwater concrete pour was completed 18 October 2010, in New Orleans, Louisiana by contractor C. J. Mahan Construction Company, LLC of Grove City, Ohio. The placement consisted of 10,251 cubic yards of concrete placed in 58.5 hours using two concrete pumps and two dedicated concrete batch plants. Upon curing, this placement allows the 50,180-square-foot (4,662 m2) cofferdam to be dewatered approximately 26 feet (7.9 m) below sea level to allow the construction of the Inner Harbor Navigation Canal Sill & Monolith Project to be completed in the dry. ^ The Roman Pantheon: The Triumph of Concrete Archived 6 October 2014 at the Wayback Machine. Romanconcrete.com. Retrieved on 2013-02-19. ^ Industrial Resources Council (2008). "Portland Cement Concrete". www.industrialresourcescouncil.org. Retrieved 2018-06-15. ^ National Highway Institute. "Portland Cement Concrete Materials" (PDF). Federal Highway Administration. ^ Moore, David (1999). "The Pantheon". romanconcrete.com. Archived from the original on 1 October 2011. Retrieved 26 September 2011. ^ Smil, Vaclav (2016-12-04). Making the Modern World: Materials and Dematerialization. Lulu Press, Inc. ISBN 9781365581908. ^ "concretus". Latin Lookup. Archived from the original on 12 May 2013. Retrieved 1 October 2012. ^ a b Gromicko, Nick; Shepard, Kenton (2016). "The History of Concrete". International Association of Certified Home Inspectors, Inc. Retrieved 2018-12-27. ^ Heinrich Schliemann; Wilhelm Dörpfeld; Felix Adler (1885). Tiryns: The Prehistoric Palace of the Kings of Tiryns, the Results of the Latest Excavations. New York, New York: Charles Scribner's Sons. pp. 190, 203, 204, 215. ^ Amelia Carolina Sparavigna, "Ancient concrete works"
^ Stella L. Marusin (1 January 1996). "Ancient Concrete Structures". Concrete International. 18 (1): 56–58. ^ "The History of Concrete". Dept. of Materials Science and Engineering, University of Illinois, Urbana-Champaign. Archived from the original on 27 November 2012. Retrieved 8 January 2013. ^ Lancaster, Lynne (2005). 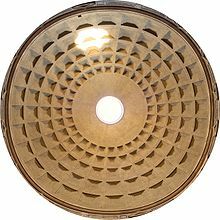 Concrete Vaulted Construction in Imperial Rome. Innovations in Context. Cambridge University Press. ISBN 978-0-511-16068-4. ^ Jackson, Marie D.; Landis, Eric N.; Brune, Philip F.; Vitti, Massimo; Chen, Heng; Li, Qinfei; Kunz, Martin; Wenk, Hans-Rudolf; Monteiro, Paulo J. M.; Ingraffea, Anthony R. (30 December 2014). "Mechanical resilience and cementitious processes in Imperial Roman architectural mortar". PNAS. 111 (52): 18484–18489. Bibcode:2014PNAS..11118484J. doi:10.1073/pnas.1417456111. PMC 4284584. PMID 25512521. ^ "Secret of how Roman concrete survived tidal battering for 2,000 years revealed". The Telegraph. Archived from the original on 4 July 2017. ^ Nick Gromicko & Kenton Shepard. "the History of Concrete". The International Association of Certified Home Inspectors (InterNACHI). Archived from the original on 15 January 2013. Retrieved 8 January 2013. ^ Herring, Benjamin. "The Secrets of Roman Concrete" (PDF). Romanconcrete.com. Archived (PDF) from the original on 15 September 2012. Retrieved 1 October 2012. ^ Courland, Robert (2011). Concrete planet : the strange and fascinating story of the world's most common man-made material. Amherst, N.Y.: Prometheus Books. ISBN 978-1616144814. Archived from the original on 4 November 2015. Retrieved 28 August 2015. ^ The History of Concrete and Cement. Inventors.about.com (2012-04-09). Retrieved on 2013-02-19. ^ "Francois Coignet - French house builder". Retrieved 23 December 2016. ^ « Château de Chazelet » [archive], notice no PA00097319, base Mérimée, ministère français de la Culture. ^ Evelien Cochez; Wouter Nijs; Giorgio Simbolotti & Giancarlo Tosato. "Cement Production" (PDF). IEA ETSAP, Technology Brief I03, June 2010: IEA ETSAP- Energy Technology Systems Analysis Programme. Archived from the original (PDF) on 24 January 2013. Retrieved 9 January 2013. ^ Gibbons, Jack. "Measuring Water in Concrete". Concrete Construction. Archived from the original on 11 May 2013. Retrieved 1 October 2012. ^ "CHAPTER 9 Designing and Proportioning Normal Concrete Mixtures" (PDF). PCA manual. Portland Concrete Association. Archived (PDF) from the original on 26 May 2012. Retrieved 1 October 2012. ^ a b "Cement hydration". Understanding Cement. Archived from the original on 17 October 2012. Retrieved 1 October 2012. ^ The Effect of Aggregate Properties on Concrete Archived 25 December 2012 at the Wayback Machine. Engr.psu.edu. Retrieved on 2013-02-19. ^ Veretennykov, Vitaliy I.; Yugov, Anatoliy M.; Dolmatov, Andriy O.; Bulavytskyi, Maksym S.; Kukharev, Dmytro I.; Bulavytskyi, Artem S. (2008). "Concrete Inhomogeneity of Vertical Cast-in-Place Elements in Skeleton-Type Buildings" (PDF). In Mohammed Ettouney. AEI 2008: Building Integration Solutions. Reston, Virginia: American Society of Civil Engineers. doi:10.1061/41002(328)17. ISBN 978-0-7844-1002-8. Archived (PDF) from the original on 3 April 2015. Retrieved 25 December 2010. ^ Exposed Aggregate Archived 12 January 2013 at the Wayback Machine. Uniquepaving.com.au. Retrieved on 2013-02-19. ^ a b U.S. Federal Highway Administration (14 June 1999). "Admixtures". Archived from the original on 27 January 2007. Retrieved 25 January 2007. ^ Cement Admixture Association. "Admixture Types". Archived from the original on 3 September 2011. Retrieved 25 December 2010. ^ Holland, Terence C. (2005). "Silica Fume User's Manual" (PDF). Silica Fume Association and United States Department of Transportation Federal Highway Administration Technical Report FHWA-IF-05-016. Retrieved October 31, 2014. ^ Kosmatka, S.; Kerkhoff, B.; Panerese, W. (2002). Design and Control of Concrete Mixtures (14 ed.). Portland Cement Association, Skokie, Illinois. ^ Gamble, William. "Cement, Mortar, and Concrete". In Baumeister; Avallone; Baumeister. Mark's Handbook for Mechanical Engineers (Eighth ed.). McGraw Hill. Section 6, page 177. ^ Kosmatka, S.H. ; Panarese, W.C. (1988). Design and Control of Concrete Mixtures. Skokie, IL, USA: Portland Cement Association. pp. 17, 42, 70, 184. ISBN 978-0-89312-087-0. ^ Paving the way to greenhouse gas reductions Archived 31 October 2012 at the Wayback Machine. Web.mit.edu (2011-08-28). Retrieved on 2013-02-19. ^ U.S. Federal Highway Administration (14 June 1999). "Fly Ash". Archived from the original on 10 July 2007. Retrieved 24 January 2007. ^ U.S. Federal Highway Administration. "Ground Granulated Blast-Furnace Slag". Archived from the original on 22 January 2007. Retrieved 24 January 2007. ^ U.S. Federal Highway Administration. "Silica Fume". Archived from the original on 22 January 2007. Retrieved 24 January 2007. ^ Mullapudi, Taraka Ravi Shankar; Gao, Di; Ayoub, Ashraf (1 September 2013). "Non-destructive evaluation of carbon nanofibre concrete". Magazine of Concrete Research. 65 (18): 1081–1091. doi:10.1680/macr.12.00187. ^ "Evaluation of Electrically Conductive Concrete Containing Carbon Products for Deicing" (PDF). ACI Materials Journal. Archived from the original (PDF) on 10 May 2013. Retrieved 1 October 2012. ^ Premixed cement paste Archived 28 September 2007 at the Wayback Machine. Concreteinternational.com (1989-11-01). Retrieved on 2013-02-19. ^ "ACI 304R-00: Guide for Measuring, Mixing, Transporting, and Placing Concrete (Reapproved 2009)". ^ "Concrete Testing". Archived from the original on 24 October 2008. Retrieved 10 November 2008. ^ Tiwari, AK; Chowdhury, Subrato (2013). "An over view of the application of nanotechnology in construction materials". Proceedings of the International Symposium on Engineering under Uncertainty: Safety Assessment and Management (ISEUSAM-2012). Cakrabartī, Subrata., Bhattacharya, Gautam. New Delhi: Springer India. p. 485. ISBN 9788132207573. OCLC 831413888. ^ Fridman, Vladen (22 August 1995). "Method for producing Construction Mixture for concrete patent number: 5,443,313". ^ Raki, Laila; Beaudoin, James; Alizadeh, Rouhollah; Makar, Jon; Sato, Taijiro (2010). "Cement and Concrete Nanoscience and Nanotechnology". Materials. 3 (2): 918–942. Bibcode:2010Mate....3..918R. doi:10.3390/ma3020918. ISSN 1996-1944. Archived from the original on 15 March 2015. ^ Fridman, Vladen (March 1, 2018). "NANOCONCRETE". ^ R.A. Olson; et al. (1995). "Interpretation of the impedance spectroscopy of cement paste via computer modeling. Part III Microstructural analysis of frozen cement paste". Journal of Materials Science. 30: 5081. ^ a b c d e Navdeep Kaur Dhami; Sudhakara M. Reddy; Abhijit Mukherjee (2012). "Biofilm and Microbial Applications in Biomineralized Concrete". Archived from the original on 19 December 2013. ^ a b General Chipping. "How Do I Protect My Team and Those Around Them from Cement Dust? ", General Chipping. Retrieved on 5 November 2018. ^ "CDC - NIOSH Publications and Products - Control of Hazardous Dust When Grinding Concrete (2009-115)". www.cdc.gov. Archived from the original on 20 August 2016. Retrieved 13 July 2016. ^ OSHA Fact Sheet. "OSHA’s Respirable Crystalline Silica Standard for General Industry and Maritime", Occupational Safety and Health Administration. Retrieved on 5 November 2018. ^ General Chipping. "Safety at the Forefront: Ergonomics in Concrete Work", General Chipping. Retrieved on 5 November 2018. ^ General Chipping. "Why (and How) You Should Stretch Before Strenuous Physical Work", General Chipping. Retrieved on 5 November 2018. ^ a b General Chipping. "Confined Spaces: Understanding the Hazards of Concrete Chipping", General Chipping. Retrieved on 5 November 2018. ^ General Chipping. "How Can I Protect My Team During Hot Summer Months? ", General Chipping. Retrieved on 5 November 2018. ^ General Chipping. "How Can I Encourage Cold Weather Safety for My Crew? ", General Chipping. Retrieved on 5 November 2018. ^ "Structural lightweight concrete" (PDF). Concrete Construction. The Aberdeen Group. March 1981. Archived from the original (PDF) on 11 May 2013. ^ "Ordering Concrete by PSI". American Concrete. Archived from the original on 11 May 2013. Retrieved 10 January 2013. ^ a b Henry G. Russel, PE. "Why Use High Performance Concrete?" (PDF). Technical Talk. Archived (PDF) from the original on 15 May 2013. Retrieved 10 January 2013. 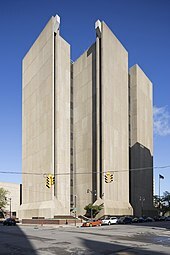 ^ "Concrete in Practice: What, Why, and How?" (PDF). NRMCA-National Ready Mixed Concrete Association. Archived (PDF) from the original on 4 August 2012. Retrieved 10 January 2013. ^ Lomborg, Bjørn (2001). The Skeptical Environmentalist: Measuring the Real State of the World. p. 138. ISBN 978-0-521-80447-9. ^ "Minerals commodity summary – cement – 2007". US United States Geological Survey. 1 June 2007. Archived from the original on 13 December 2007. Retrieved 16 January 2008. ^ a b Mass Concrete Archived 27 September 2011 at the Wayback Machine. (PDF) . Retrieved on 2013-02-19. ^ "Winter is Coming! Precautions for Cold Weather Concreting | FPrimeC Solutions". FPrimeC Solutions. 14 November 2016. Archived from the original on 13 January 2017. Retrieved 11 January 2017. ^ "306R-16 Guide to Cold Weather Concreting". Archived from the original on 15 September 2017. ^ "Mapping of Excess Fuel Consumption". Archived from the original on 2 January 2015. ^ Rubenstein, Madeleine. "Emissions from the Cement Industry". State of the Planet. Earth Institute, Columbia University. Archived from the original on 22 December 2016. Retrieved 13 December 2016. ^ John Gajda (2001) Energy Use of Single Family Houses with Various Exterior Walls, Construction Technology Laboratories Inc.
^ Green Building with Concrete. Taylor & Francis Group. 2015-06-16. ISBN 978-1-4987-0411-3. ^ "Features and Usage of Foam Concrete". Archived from the original on 29 November 2012. ^ Luis Emilio Rendon Diaz Miron; Dessi A. Koleva (27 April 2017). Concrete Durability: Cementitious Materials and Reinforced Concrete Properties, Behavior and Corrosion Resistance. Springer. pp. 2–. ISBN 978-3-319-55463-1. ^ Geoffrey Michael Gadd (March 2010). "Metals, minerals and microbes: geomicrobiology and bioremediation". Microbiology. 156 (Pt 3): 609–643. doi:10.1099/mic.0.037143-0. PMID 20019082. Archived from the original on 25 October 2014. ^ De Belie, Nele (2000). "Durability of Building Materials and Components in the Agricultural Environment, Part III: Concrete Structures". J. Agric. Engng Res. ^ "What is the development impact of concrete?". Cement Trust. Archived from the original on 17 September 2012. Retrieved 10 January 2013. ^ a b Vidal, John (2019-02-25). "Concrete is tipping us into climate catastrophe. It's payback time". The Guardian. Retrieved 2019-02-27. ^ Rinde, Meir (2017). "Concrete Solutions". Distillations. 3 (3): 36–41. Retrieved 19 June 2018. ^ "Reducing Urban Heat Islands" (PDF). United States Environmental Protection Agency. ^ Shepherd & Woskie. "Controlling Dust from Concrete Saw Cutting" (PDF). Journal of Occupational and Environmental Hygiene. Archived (PDF) from the original on 8 April 2014. Retrieved 14 June 2013. ^ General Chipping. "How Does Concrete Recycling Work? ", General Chipping. Retrieved on 5 November 2018. ^ Occupational Safety and Health Administration. "OSHA’s Respirable Crystalline Silica Standard for General Industry and Maritime", Occupational Safety and Health Administration. Retrieved on 5 November 2018. ^ General Chipping. "How Often Should I Plan Concrete Removal for My Drums and Central Mixers? ", General Chipping. Retrieved on 5 November 2018. ^ "Itaipu Web-site". 2 January 2012. Archived from the original on 9 February 2012. Retrieved 2 January 2012. ^ a b China’s Three Gorges Dam By The Numbers Archived 29 March 2017 at the Wayback Machine. Probeinternational.org. Retrieved on 2017-03-28. ^ "Concrete Pouring of Three Gorges Project Sets World Record". People’s Daily. 4 January 2001. Archived from the original on 27 May 2010. Retrieved 24 August 2009. ^ "Concrete Pumping to 715 m Vertical – A New World Record Parbati Hydroelectric Project Inclined Pressure Shaft Himachal Pradesh – A case Study". The Masterbuilder. Archived from the original on 21 July 2011. Retrieved 21 October 2010. ^ "SCHWING Stetter Launches New Truck mounted Concrete Pump S-36". NBM&CW (New Building Materials and Construction World). October 2009. Archived from the original on 14 July 2011. Retrieved 21 October 2010. ^ "Concrete Supplier for Landmark Tower". Archived from the original on 15 May 2013. ^ "The world record Concrete Supplier for Landmark Tower Unibeton Ready Mix". Archived from the original on 24 November 2012. ^ Al Habtoor Engineering Archived 8 March 2011 at the Wayback Machine – Abu Dhabi – Landmark Tower has a record-breaking pour – September/October 2007, Page 7. ^ "Continuous cast: Exxcel Contract Management oversees record concrete pour". US Concrete Products. 1 March 1998. Archived from the original on 26 May 2010. Retrieved 25 August 2009. ^ Exxcel Project Management – Design Build, General Contractors Archived 28 August 2009 at the Wayback Machine. Exxcel.com. Retrieved on 2013-02-19. "Concrete" . The New Student's Reference Work . 1914.